kt literary » Blog Archive » Episode One of REMADE available now! Episode One of REMADE available now! Congratulations to KT Literary clients Matthew Cody and Carrie Harris! Episode One of their new project, the serialized YA adventure REMADE is available today to download and subscribe! Every minute, 108 people die. This fall, in one of those minutes, twenty-three of those deaths will be teenagers. Now they are humanity’s last hope for survival. Awakened in a post-apocalyptic world and hunted by mechanical horrors, these teens search for answers amidst the ruins of civilization. Fate, love, and loyalty face off in this adrenaline-pumping YA adventure. Created by Matthew Cody and brought to life by a writer’s room of awesome talent – Carrie Harris, E.C. 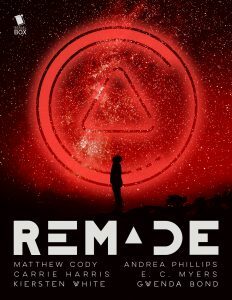 Myers, Andrea Phillips, Kiersten White and Gwenda Bond – REMADE is a post-apocalyptic thriller featuring teens on the run, killer robots and more. Subscribe online, or check out the trailer below. ← A warm welcome to Isis Rushdan!